Girl at the End of the World, Vol 1 is a two-volume anthology dedicated to exactly what the title says women & girls at the end of the world. My story, “Sophie and the Gate to Hell appears in the first volume. Based on true events, “Sophie” is the story of one woman’s struggle to eat lunch and get some work done despite an intrusive landlord and Things that are probably from Hell. It’s the end of days. The sky is falling, the seas are burning and your neighbour is a zombie. It’s brutal out there. It’s every man for himself and these heels are going to have to go; you simply can’t run in them! 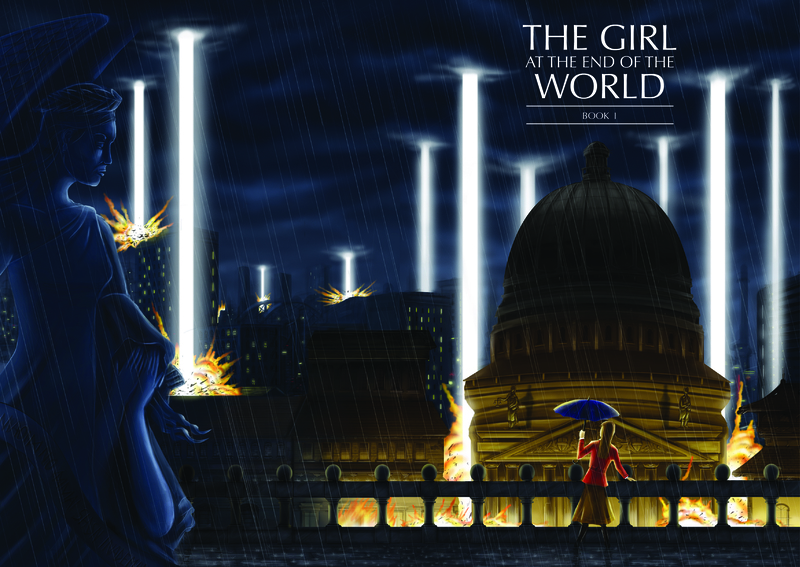 Across two volumes, The Girl at the End of the World offers forty-one striking visions of the apocalypse and the women and girls dealing with it. From gods to zombies, from epic to deeply personal, from the moment of impact to a future where life is long forgotten; bestselling authors and exciting new writers deliver tales you’ll still remember when holed up in a fallout shelter with one remaining bullet and a best friend with a suspicious bite mark on their neck. Click through to see a list of the stories and authors included and more of the fantastic art work by Dave Johnson. I understand that a second variant cover will be available soon, too!